A very non-linear throttle. 25% pedal travel is much less than 25% throttle, 50% is less than 50% throttle, etc. Not until you're close to 100% does pedal travel match throttle opening. Even with the pedal at 100%, you don't actually get full throttle in lower gears below about 3,000 rpm. There may be more that I don't remember. The goal behind this programming is two-fold: Largely to preserve the drive-train, but also possibly to preserve the driver's health and life. In general, supercharged engines have very little lag compared to turbocharged engines, but as there's less boost at low rpm, there will probably be a feeling that power doesn't come on until the revs rise. Combined with torque management, that's probably what you're feeling. Software upgrade? A custom tune can reduce the torque management and make throttle response more linear, at the expense of possibly allowing GM to deny warranty coverage for engine and drivetrain issues. There's an add-on device from a company called Vitesse that will address the non-linear throttle, but not the other torque management programming. Last edited by meyerweb; 08-22-2017 at 09:07 PM. Is your car an auto or a manual please? Let me guess. You have an A8 Z06, and you have been driving in Tour mode, haven't you? If my life depended on getting from 0-30 MPH as quickly as possible, and if my choices were my 2016 Z06 A8 in Tour mode, or my 1999 Oldsmobile Intrigue, I would choose the '99 Intrigue if I wanted to live. I have written about this abject failure of the Z06+A8+Tour in many posts on this forum. I agree with you: it is dangerous being so slow. I don't trust it in an intersection near home which has limited visibility with cross traffic which does not stop and has a speed limit of 55 MPH. Forget the Vitesse throttle controller. It will not help you. That just changes the percent throttle commanded versus the percent pedal depression. That isn't the problem with your car. The problem with your car is timing lag between pressing the pedal and getting any positive throttle at all. 1) Trade the car off and get a C7 which is not a Z06+A8. Apparently the Z06+A8 is the only one with this horrible lag problem. 2) Get an aftermarket software tune to get rid of the lag (and probably kiss at least part of your power-train warranty goodbye). 3) Stop using Tour Mode when you need reliable acceleration, and get ready for a rougher ride in Sport or Track because of the harsher suspension. Anyway, I know exactly what you are talking about, and I have the same problem. There are a few threads around here started by other Z06+A8 owners. So, you and I are not alone. Of course, that gives no consolation, I know. Finally, to answer your question, supercharged cars should not be this way. That is an advantage of a supercharger over a turbocharger: the supercharger requires no lag and has no spool-up time like a turbocharger does. The problem with the Z06+A8+Tour mode is all in the software. How do I know? Because putting my Z06+A8 in Sport mode makes the lag problem MUCH better, and putting it in Track mode gets rid of the lag problem altogether. However, then you have to deal with a rougher ride. Last edited by rdslon01; 08-22-2017 at 10:47 PM. TexDan, Static and RoninX like this. I am sure there are more, but I don't want to do a lot of different keyword searches since it is bedtime. mine is a 2017 Z06 with only 1500 Miles. I have the A8, I experience no lag time in T mode, when I punch it, it goes. I may not be familiar with all the nuances associated with this multi-talented speed demon machine, but it's more than enough for me. U.S. Marine and plasboy like this. I have a Stingray that I've recently started driving in Tour mode. I prefer Sport, but for in town stop and go driving, the transmission (A8) is much smoother in Tour. I feel that any issues I've encountered with the A8 so far, can be blamed on software. I've had about three incidents where it felt like I was hit from behind as the car downshifted while coming to a stop while in Sport mode. I've also experienced moments of "confusion" where the car acted like I was going to accelerate when coming to a stop, or vice versa, again... In Sport mode. So far, Tour has been silky smooth. I notice a little worse throttle response and some torque limiting while in Tour, but when I step on the gas I'm still quicker than 90% of the other cars on the road. There is NO problem accelerating to merge or join traffic from a dead stop...so it seems crazy that the Z06 would have that issue! Maybe GM got too intrusive with the Tour programming on the Z06? Is it possible to unlink the suspension settings from driver mode, like it is with steering and exhaust? I've been driving in tour with steering set to sport and exhaust set to track. Last edited by STINGmole; 08-25-2017 at 02:34 PM. It is not possible to unlink either the suspension setting or the throttle response from the drive mode. If it were possible, I could be made a happy camper. I would leave the suspension in Tour, and put the throttle in Track (or maybe Sport). That would be great. As it is, right now I turn the dial to Track when I need standing stop acceleration which is reliable with no lag, and then twist it back to Tour once I get going. I need to do this regularly at an intersection near home: pull out from the side road and cross the main road in Track, but rotate the dial back to Tour before I get to the bridge which can present a hard jolt crossing the road/bridge threshold if I am in Track. Just because they had the ability to create different throttle responses for Tour versus Sport in the A8 Z06 does not mean they should have. That was a crazy programming mistake. I guess I'm the only one thinking, "DON'T do this!" Contrary to popular belief, these cars aren't teleporters. jsvette, ALCHMST and duckvett like this. Living a good life elsewhere: 2009 Z06 70,000 + miles. 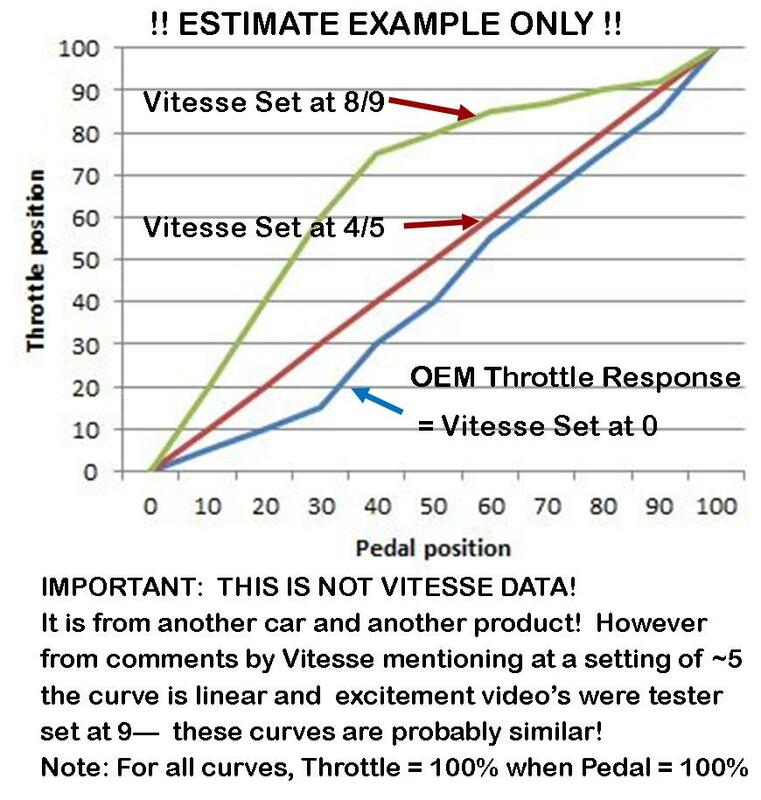 Below is "my estimate" from observation of what the Vitesse Throttle Control settings do and what the OEM Pedal response in Touring feels like. Was used to driving my 2014 Z51 (none mag shocks) in Sport all the time. The OEM throttle response in 2014 was more aggressive when in Sport and Track. In fact the table for 2014 showed them to be equal. In my 2017 Grand Sport GM shows 4 OEM throttle settings, Weather (slow); ECO/Touring (normal); Sport more aggressive; and Track most aggressive. Driving my Grand Sport in Track will rattle your teeth! I modestly drive in Touring. Added a Vitesse system and have it set for 4 or 5. Happy with the improved throttle response. Last edited by Jerry U; 08-25-2017 at 07:59 PM. Having experienced the A8 Z06 lag, I don't think the Vitesse will do anything to help. The problem with the Z06 isn't how far down you push the pedal, it is the timing delay between pushing the pedal and having the RPMs increase. The Vitesse will only change the percent throttle versus pedal position. That isn't the problem with the A8 Z06. When you at least moderately aggressively push the pedal down for the A8 Z06 when in Tour, the RPMs DECREASE below the normal idle RPMs. It almost feels like the engine is going to stall. Only after the car starts rolling a little bit will the throttle then increase and the RPMs pick back up. It is clearly the nannies WAY overcompensating to make sure they kill any possibility of wheel spin. However, the fact that I can get around this lag by putting the car in Sport or Tour (AND STILL NOT GET ANY WHEEL SPIN IN THE SAME CONDITIONS) says that the programmers took WAY too much out of the tip-in throttle response for Tour. I could believe that the Vitesse might even make the lag worse because the nannies would then start overcompensating for an even more aggressive throttle tip-in. In other words, it would be like someone stomping on the pedal more than just gently pushing it down. I think the lag would be worse in that case, especially since I have noticed that the more I need the car to accelerate from a standing stop in Tour (and, consequently, the more throttle I give it when starting to pull out), the more I notice just how bad the lag is. In other words, the lag isn't nearly as bad (not even noticable) if you ever so slightly give the car gas while starting to pull out while going level (or even better, going downhill), but doing that can cause the Z06 to initially (first second or so) accelerate more slowly than even the Acadia can. Last edited by rdslon01; 08-26-2017 at 09:10 AM. Have no idea what most of the problems are lol. Just use Sport which is the min I use and I do not use it that often usually run it in track without nannies. I have extra hp, cam, head work, E8, Meth spray, etc that makes my power instant but even before all of the work and reprogramming there was no lag in my A8.. Just change the settings with the dial---anything less than Sport is for little old ladies and cruising on the highway imho. Last edited by Busa Dave; 08-26-2017 at 09:02 AM. Dave, I don't think you will be able to replicate the issue because you did a software tune. As you said above, and I completely agree, "the software is your issue not the vehicle or transmission." Oh, and the reason I want to use Tour is to get a less harsh ride over somewhat less-than-optimal road surfaces. Busa Dave and ferraf like this.